The Precision Metalforming Association's 2016 Awards of Excellence honor some of the industry's highest achievers in areas like product development, innovation and technology, and training and education. On November 15, 2016, six companies– HK Metalcraft Manufacturing Company, Tella Tool & Mfg. Co., E&E Manufacturing Co., Inc., Federal Tool & Engineering, LLC, Pentaflex, Inc., and DeWys Manufacturing, Inc.– found out that they had more in common than they already knew. It was on that date that they were announced, at the FABTECH tradeshow in Las Vegas, as winners of the Precision Metalforming Association's (PMA) 2016 Awards of Excellence in Metalforming. The PMA program annually recognizes high standards of achievement by honoring top performers in the areas of design, safety, quality, innovation and technology, training and education, process control, product development, and productivity. All six companies, along with Middle Tennessee State University, the winner of the educational institution award, received a special plaque, commemorative flag, and cash prize. The PMA is a trade association that represents North America's metalforming industry, which creates precision metal products via manufacturing processes such as stamping, fabricating, spinning, slide forming, and roll forming. Its nearly 900 member companies include suppliers of equipment, materials, and services to the industry. Following are summaries of five of the winning companies' accomplishments that were recognized as winners by the Precision Metalforming Association. HK Metalcraft Manufacturing Company won the 2016 Plex Systems Innovation and Technology Award for implementing cloud technology that improved company-wide information sharing and internal communications, gained more information through data with built-in quality checks and live statistical process control (SPC), and improved operations with more accurate process controls. The company, located in Lodi, New Jersey, manufactures precision metal stampings, metal gaskets, spring washers, formed products, and related assemblies for industries worldwide. In the 1980s, HK Metalcraft installed a single company-wide enterprise-resource-planning (ERP) system before others in the industry had considered it. Nearly three decades later, the company replaced its legacy ERP with an ERP cloud system. Now, HK Metalcraft has serialized container level inventory, making lot control much more accurate. It also has more finished inventory, less work in process, and more detailed process routings. 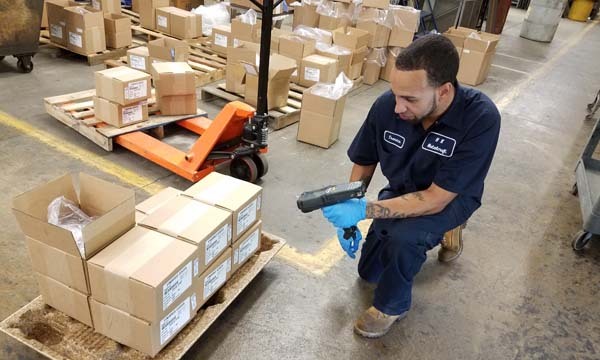 By implementing an ERP cloud system, HK Metalcraft Manufacturing Company (Lodi, N.J.) has serialized container level inventory, making lot control much more accurate. It also has more finished inventory, less work in process, and more detailed process routings. Photo courtesy of HK Metalcraft/PMA. Additionally, HK Metalcraft (www.hkmetalcraft.com) collects data from its plant floor and checks SPC on every product dimension to ensure accuracy. The company looks at the part-cost structure and sees the direct overhead, variable overhead, and direct labor. As process routings and rates are tweaked, HK Metalcraft looks at part cost structures to find areas of profit or loss. All of this is enabled by the cloud-based ERP systems. More information on downtime also is tracked. The company's old press system required operators to manually input downtime with reason codes. With no standards around this process, operators would sometimes enter general codes, leading to inaccurate reporting. In implementing the ERP cloud system, HK Metalcraft now knows what causes the downtime and has an audit trail to pinpoint a better solution. HK Metalcraft continues leveraging cloud technology to build out an Industrial Internet of Things strategy, which includes connected press counters, digital scales, optical inspection systems, and shop-floor dashboards to display performance in real time. The Innovation and Technology Award, sponsored by Plex Systems, Inc., of Troy, Michigan, is one of nine Awards of Excellence in Metalforming presented annually by PMA. It recognizes a metalforming company that has implemented cloud technology to drive innovation from a product or business perspective, or transform business operations; or that has leveraged cloud technology in order to scale and grow from a size or product perspective and emerge as a leader in its industry. Tella Tool & Mfg. Co. received the 2016 Zierick Manufacturing Corporation Productivity Award for streamlining the packaging process on one of its high-volume production tools that produces over three million parts per year. With locations in Lombard, Illinois, and Brownsville, Texas, Tella Tool & Mfg. is a metal-stamping, fabrication, and CNC machining business that services the automotive, aerospace, defense, and consumer-goods markets. The company established a cross-functional team to investigate and develop a more effective and efficient process. The original process for stacking, weighing, packing, and performing in-process inspection during the stamping process required three operators. With the press running at 37 strokes per minute, parts would become tangled and twisted while sliding down the exit chute after exiting the production tool, leading to numerous press stoppages and significant downtime. Parts were then required to be manually weight counted to ensure that 120 parts per bundle were properly oriented and wrapped with interleaf paper. Finally, three bundles were placed together into a carton ready for shipment. Tella Tool & Mfg. Co. designed and fabricated a machine called the "Auto Stacker," an automated piece of equipment that orients, stacks, and counts parts as they exit the production tooling and travel down the conveyor. The Auto Stacker includes 12 magazines, situated evenly around a precision indexing carousel with cartridges engineered to wrap bundles with paper interleaf. Programmable logic controllers (PLCs) and electronic sensors control automated indexing of magazines, timing of the servo motor, and the number of parts needed per bundle. Photo courtesy of Tella Tool & Mfg. Co./PMA. The cross-functional team brainstormed many ideas that finally led to the development of a machine called the "Auto Stacker." This automated piece of equipment orients, stacks, and counts parts as they exit the production tooling and travel down the conveyor. The Auto Stacker was completely designed and fabricated in-house by Tella Tool (www.tellatool.com). 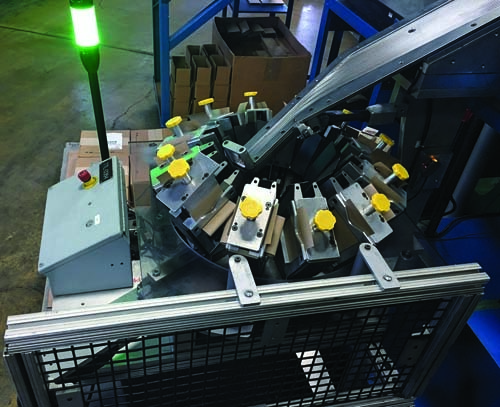 The Auto Stacker includes 12 magazines, situated evenly around a precision indexing carousel with cartridges engineered to wrap bundles with paper interleaf. Programmable logic controllers (PLCs) and electronic sensors control automated indexing of magazines, timing of the servo motor, and the number of parts needed per bundle. This new process allows for a single operator to complete the entire stamping and packaging operation, while effectively performing in-process inspection– all of this while not having to stop the press. It is reported to completely eliminate the need to manually stack, weigh, and count the parts coming off of the press. With the development and implementation of the Auto Stacker, Tella Tool reports that it has achieved many productivity improvements. Press speed was increased by 48 percent, resulting in an additional 624 available press hours per year. Also, two operators were redeployed to other areas within Tella Tool. As a result of the increased efficiencies and labor redeployment, a total savings of approximately $114,000 per year was realized. The Productivity Award, sponsored by Zierick Manufacturing Corp., Mount Kisco, New York, recognizes outstanding achievement by a manufacturing company in the development and implementation of programs, processes, and use of assets that lead to significant improvements in productivity. Federal Tool & Engineering, LLC took home the 2016 Higgins-Caditz Design Award for its redesign of a CB mounting bracket used in securing heating cables to the exterior of commercial food service ovens. The award, created by the Worcester Pressed Steel Co., of Worcester, Massachusetts, and sponsored by The Quarterly Club, recognizes a manufacturing company for outstanding achievement in developing an innovative product design. For more on Federal Tool & Engineering's award, see "Federal Tool & Engineering Wins PMA Design Award for Redesign of Mounting Bracket" in the Design & Engineering Spotlight. DeWys Manufacturing Inc. was the recipient of the 2016 A.R. Hedberg Training and Education Award for an employee technical training and education program, DeWys University, which it developed to meet the company's growing human-resources requirements. The Marne, Michigan-based company is a provider of custom metal fabrication services, including custom engineering and product development, and specializes in lean manufacturing. DeWys University welcomed its first students in January 2012 by offering a progressive welding class. The university has since expanded its curriculum and offers training in key technological positions, such as welding, press brakes, machining, and powder-coating applications. These programs offer DeWys Manufacturing a strong pool of trained and motivated team members with skills that are in high demand. One of the programs offered is weld training, designed to develop team members to be proficient welders. DeWys Manufacturing identified some of its best and brightest shop-floor employees to establish the welding curriculum and become trainers. DeWys University offers training in key technological positions, such as welding, press brakes, machining, and powder-coating applications. The programs offer DeWys Manufacturing a strong pool of trained and motivated team members with skills that are in high demand. Photo courtesy of DeWys Manufacturing/PMA. Each of the DeWys University training programs can accommodate one or two trainees per session. The weld-training program typically has two students, who spend six weeks working hands-on with the trainer. During this time, the trainer evaluates technique, commitment to the company, and overall capabilities. After the first six weeks, trainees move to predetermined shifts and departments. At that time, they are paired with mentors to help as needed. The overall process to make a new trainee an efficient welder is approximately six months. DeWys University works to consistently have new trainees in the pipeline based on open positions. 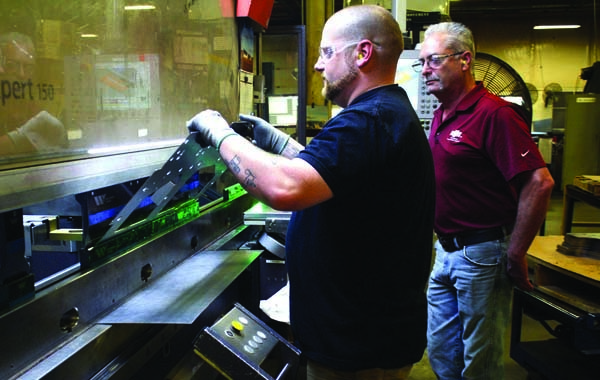 Press brake and welding have been the two most consistent areas for training needs. To get into these programs, trainees go through multiple interviews, as well as skills tests or mechanical reasoning tests. The University is meant for new and current team members. Each program has five or six levels that vary based on skills, abilities, and years of service. The creation of the in-house training program is said to have resulted in an increase of team members, wages, and overall morale at DeWys Manufacturing, in addition to providing the company with its needed skilled labor. The Training and Education Award recognizes an outstanding achievement by a company in employee technical education through a comprehensive training program. The award is sponsored by HPL Stampings, Inc., Lake Zurich, Illinois, in memory of A.R. (Ray) Hedberg, a leader in employee training. Pentaflex, Inc., a contract stamper specializing in deep-drawn, heavy-gauge stampings and welded assemblies for the heavy-truck market, earned the 2016 Ulbrich Award for Excellence in Product Development for developing and processing a stamped brake spider for use in class 8 trucks. The Product Development Award acknowledges a manufacturing company that demonstrates outstanding innovation in developing and manufacturing a product that best uses metal in place of a nonmetal competitive material, or that develops a product using flat-rolled material that was previously manufactured using more costly manufacturing processes. It is sponsored by Ulbrich Stainless Steels and Special Metals, Inc., North Haven, Connecticut. 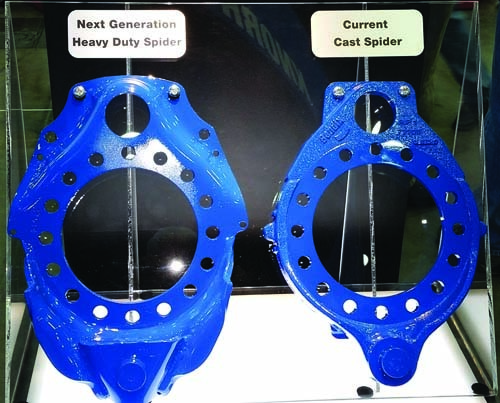 Pentaflex developed and processed a stamped brake spider that replaced a cast brake spider with significant cost savings– nearly $2 per part, depending on the spider. The final stamped spider assembly is reported to save 3 to 6 pounds of weight per vehicle. Photo courtesy of Pentaflex, Inc./PMA. Pentaflex, headquartered in Springfield, Ohio, also services the automotive, agricultural, off-highway, and defense industries. The company's customer had noted an opportunity to introduce a stamped brake spider to replace an existing cast brake spider in order to obtain a significant cost and weight advantage. Because of the brake loads seen in applications in excess of 26,000 lbs., brake spiders for such applications routinely have been manufactured as castings. Pentaflex (www.pentaflex.com) was integrally involved in supporting the development effort via its manufacturing capabilities in forming, welding, machining, and assembling. As developed, the stamped spider permitted an easier-to-form, high-strength, low-alloy steel spider with improved stiffness, strength, and durability. A 1600-ton mechanical press was refurbished and a new part-transfer system, needed to form the spider in volume production, was purchased to support the tighter design requirements. Additionally, the assembly process required new gas-metal-arc welding equipment for welding the strap to the spider form, and the design specifications for reduced machine tolerances required a new CNC machine. A second existing press was then tooled for stamping the wheel-attachment hole pattern into the spider. From release of the first prototypes to the program's launch in the summer of 2015, Pentaflex has undertaken a continuous product development effort. Production to date has totaled more than 100,000 spiders and now includes more than 80 spider variations for different OEM customers. The cost and weight savings achieved with the development of the stamped spider over the cast spider were significant. Cost savings total nearly $2 per part, depending on the spider, and the final stamped spider assembly in production results in weight savings of 3 to 6 lbs. per vehicle, based on customer analysis. More information on PMA's Awards of Excellence in Metalforming is available at www.pma.org/awards.